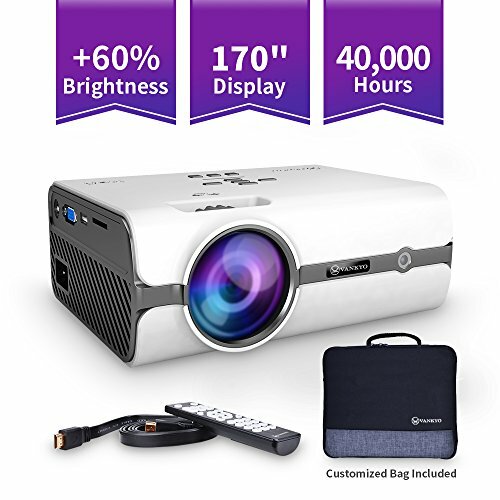 MULTIMEDIA PORTABLE PROJECTOR: VANKYO Leisure 410 hd projectors equipped with a variety of inputs, including HDIMI, VGA, AV, USB and Micro SD, allows you to connect a wide variety of HD devices to easily display your content. Such as Amazon Fire TV Stick, smartphone, laptop, PS3, PS4, X-Box ONE or Wii. INTEGRATED SPEAKER & CUSTOMIZED BAG: The built-in speaker offers excellent audio support. Easy to set up without the need for costly external speakers. A customized bag is designed for you to carry and store it easily.